Apis dorsata laboriosa, the Himalayan honey bee, is the world’s largest honey bee; single adults can measure up to 3.0 cm (1.2 in) in length. Before 1980, Apis dorsata laboriosa was considered to be a subspecies of the widespread Apis dorsata, the giant honey bee, but in 1980 and for almost 20 years thereafter it was elevated to the rank of a separate species. It is now classified once again as a subspecies of Apis dorsata (Engel, 1999). It is highly adapted to its highland habitat in behavior and there has evidently been little gene flow between it and lowland A. dorsata for millions of years; some consider this evidence that it should be classified as a species (Arias & Sheppard 2005). Limited to the Himalayas, it is the largest of the Apis species. So far it has only been identified in the mountainous regions of Bhutan, the Chinese province of Yunnan, India, and Nepal. It mostly nests at altitudes between 2,500 and 3,000 m (8,200 and 9,800 ft), building very large nests under overhangs on the south-western faces of vertical cliffs. One nest can contain as much as 60 kg (130 lb) of honey. The bees forage at altitudes of up to 4,100 m (13,500 ft). Due to its peculiar nesting behavior, the Himalayan honey bee is also referred to as the Himalayan cliff honey bee. 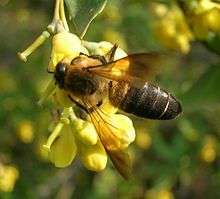 The term "Himalayan honey bee" is sometimes used more informally, for any of the four varieties of honey bees that are found in the Himalayan region; Apis cerana, Apis florea, Apis dorsata and Apis dorsata laboriosa. There are three different types of Apis dorsata laboriosa honey: spring or red honey that is collected at higher altitudes, spring honey collected at mid and lower altitudes, and autumn honey from any site. Red honey has an intoxicating effect and various relaxing qualities that decrease over storage. It is not consumed locally as it is valuable, and honey hunters prefer to sell it at a high price. As hive bees are not kept at such high altitudes, Apis dorsata laboriosa is the only bee species to produce this honey. The wholesale price of the red honey is about five times the price of regular honey from Apis mellifera or Apis cerana and large amounts of it are exported from Nepal to Japan, Korea, and Hong Kong. The red honey is prized for its purported medicinal value and intoxicating qualities which are attributed to the grayanotoxin present in the nectar collected from white rhododendrons (Rhododendron spp). The Gurung people in Nepal are renowned for their use of this mad honey, both for its medicinal and hallucinogenic properties. ↑ Ahmad, F; et al. (2003). Indigenous Honeybees of the Himalayas: The Himalayan Cliff Bee. ↑ Treza, Raphael (2011). "Hallucinogen honey hunters". topdocumentaryfilms.com. Retrieved 20 October 2015.